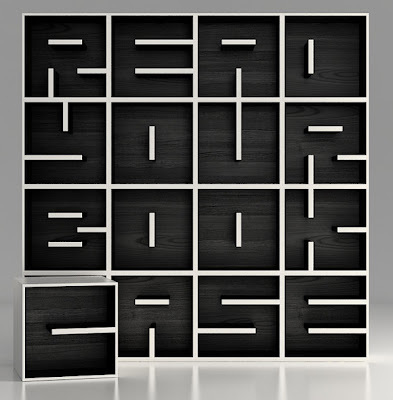 A bookcase that spells words. Modular. Customizable. = Must. Have. Now. So... if price were no object, what would your bookcase say? Wow, that is wonderful. It took me a minute to realize the pieces were letters. And now I really want it. I wonder if it would be hard to stack books in some of these letters. The A looks challenging. Ahem! For the record, your mother-in-law says, "If you have to ask, you don't want to know." Red - It could be, but I think the challenge would be fun in itself. Like a jigsaw puzzle, if you will! Kevin - Thanks for keeping my in-law quotes in line, darling. Biblio - Isn't it fun! ?